On this page we briefly explain and discuss what the Zachman Framework is and how one could make use of it. And... we have the original article for you as download at the bottom of the page. Zachman Framework is a diagram with two axes. It was created by J.A. 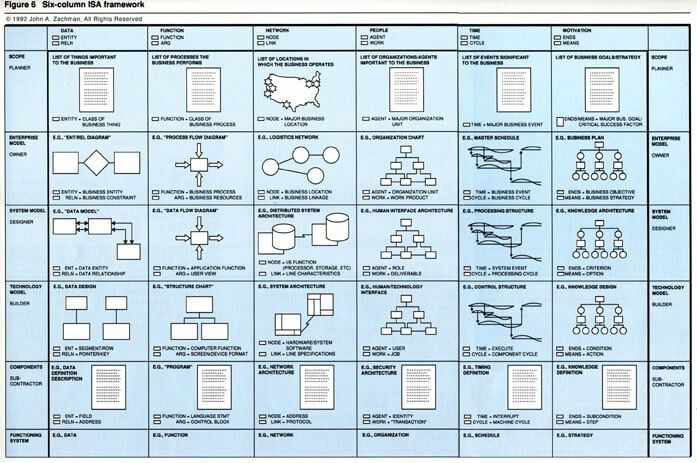 Zachman in 1987 and first was named 'Information Systems Architecture'. This axis is about the first words in 'open'-questions: What, How, When, Who, Where, and Why. This axis is about engineering phases where an idea is transformed into a thing: Identification, Definition, Representation, Specification, Configuration and Instantiation. 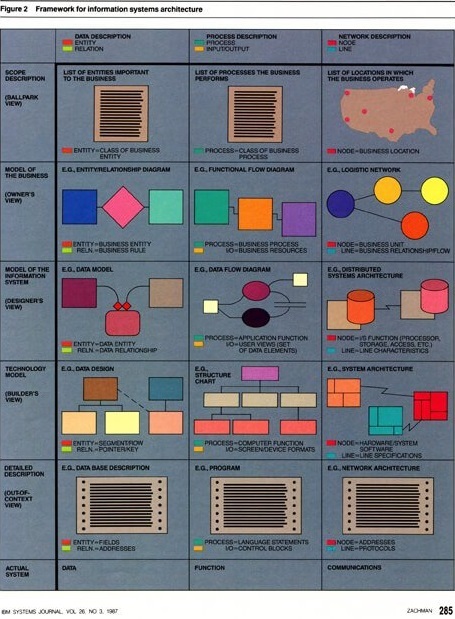 Everyone knows the shape of the Zachman Framework as a 6 x 6 matrix, and every cell contains a set of well-known diagrams. You can use the matrix as a report schema to visualize or report what type of information is available and unavailable or what type of situations are known and unknown in a certain enterprise. TOGAF as an approach to realize TOGAF-type-architecture and Zachman as a framework to get ideas for what models and diagrams to make or look for, is a good fit. 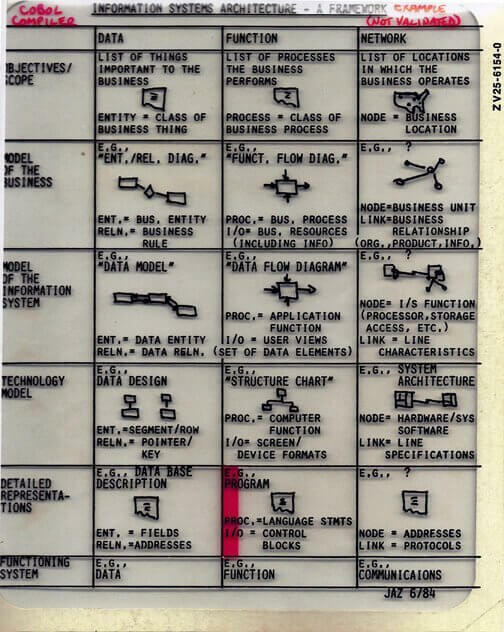 In practice there is often not enough time available to create all the Zachman models and diagrams, your people make selections of the most important ones. Zachman sees enterprise architecture as a set of (written down) primitive models. The Dragon1 open EA Method sees enterprise architecture as a total concept of an enterprise. And that total concept consists of coherent concepts. These concepts consist of elements (at a logical level) and components (at physical) level and technical products (at implementational level). The Dragon1 EA Framework recognizes all the (logical and physical) models and diagrams of Zachman but adds other (conceptual and meta) models and diagrams to that. A big difference or even maybe the main difference between the Zachman model and Dragon1 open EA Method is that Zachman makes the elements like process 'mandatory' to use an architect, whereas Dragon1 open EA Method states that if you as architect use business concepts that contain the element 'process', only then processes will become part of the architecture of your enterprise. So you might as well have an enterprise architecture without any of the elements that Zachman defines as mandatory. 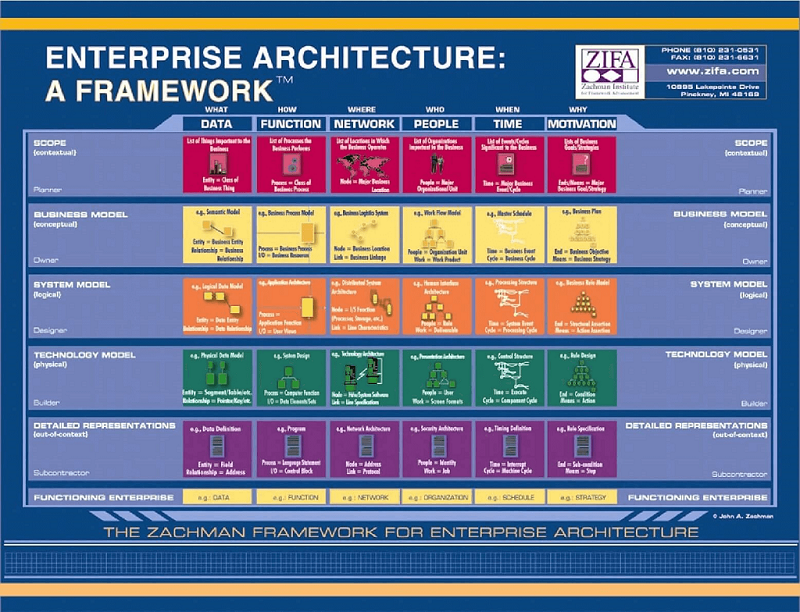 This means that from a Dragon1 open EA Method perspective Zachman is not a framework for enterprise architecture but a reference enterprise architecture for common process oriented - enterprises and organizations. In other words: Zachman limits the enterprise architectures that can be designed by an enterprise architect using the Zachman framework. And Dragon1 open EA Method does not limit the enterprise architectures that can be designed by an enterprise architect. There are no mandatory concepts or elements to use. When working with Dragon1 open EA Method, the Zachman framework example still is a valuable guideline for discovering primitives in your organization.